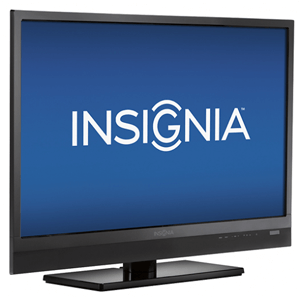 Insignia™ LED HDTV: Boasting a compact size, this Insignia™ HDTV is great for placement in a small living room, a bedroom or a dorm room. The 720p display and 50,000:1 dynamic contrast ratio present clear, rich images. A 6.5ms response time for refreshing the picture helps reduce blurring during fast-motion scenes. 50,000:1 dynamic contrast ratio (2000:1 typical) delivers remarkable picture contrast. 160° horizontal and vertical viewing angles provide a clear picture to viewers seated near the side of the screen. MHL (Mobile High-Definition Link) supports 1080p video and 5.1 digital audio surround sound playback from your compatible device (device and MHL cable required, not included). Pair with Roku Streaming Stick for access to more than 700 channels, including Netflix, Hulu Plus and HBO GO. Get more done by connecting your PC to your TV for a second display. Delivers crisp, clear and natural sound with deep, booming bass.